The Pistons come away with a 129-103 victory at home. 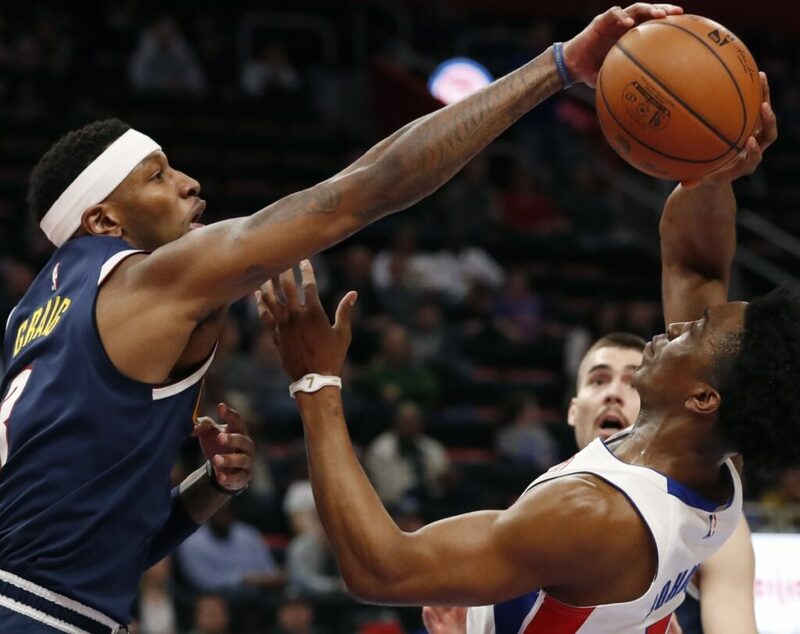 DETROIT — Andre Drummond scored 14 of his season-high 27 points in the third quarter Monday night and the Detroit Pistons snapped Denver’s six-game winning streak, beating the Nuggets, 129-103. Detroit blew a 25-point lead Saturday in a loss to the Los Angeles Clippers but poured it on this time. Blake Griffin added 17 points for Detroit, and Reggie Jackson scored 14. Denver was without forward Paul Millsap, sidelined by right ankle soreness, and also was missing Gary Harris (right adductor strain) and Jamal Murray (left ankle sprain). Denver looked sharp early, scoring 36 points in the first quarter, but managed only 19 in the second and trailed 68-55 at halftime. HAWKS 137, WIZARDS 129: Taurean Prince scored 12 of his 21 points in the fourth quarter and hit five of Atlanta’s 20 3-pointers at Washington. Rookie guard Kevin Huerter added 19 points and also hit five 3s in his return to the region where he played college ball at Maryland. Two of those 3s came during an early 16-2 run that put Atlanta up 28-16 late in the first quarter, a lead it did not give back. Trae Young added 10 points and 10 assists as nine Hawks reached double figures. Atlanta outrebounded the Wizards 51-39 and finished 20 of 41 from beyond the arc to close a 4-3 trip. BUCKS 113, NETS 94: Giannis Antetokounmpo had 30 points, 15 rebounds and nine assists, and Milwaukee won at New York. The Nets missed 19 of their first 20 3-point attempts, making it another easy night for the team with the NBA’s best record. Brooklyn finished 5 of 42 (11.9 percent) behind the arc. D’Angelo Russell scored 18 points for the Nets, who have been forced to go deep down their roster because of injuries and lost their third straight. HEAT: Chris Bosh will have his No. 1 jersey retired March 26 by the franchise. Bosh played parts of six seasons in Miami before his career was cut short by recurring issues with blood clots. He last played for the Heat in 2016. CAVALIERS-TRAIL BLAZERS: Forward Rodney Hood was traded by Cleveland, which acquired guards Nik Stauskas and Wade Baldwin – and their expiring contracts – and second-round picks in 2021 and 2023 from Portland. Before the trade could be completed, the Cavaliers needed Hood, 26, to agree to the deal because he signed a one-year $3.4 million qualifying offer this summer. He waived his no-trade clause to join the Blazers, who are 32-20 and have the fourth-best record in the Western Conference. NETS: Guard Caris LeVert will practice with the team’s G League affiliate Tuesday as he works to return from a dislocated right foot. MAVERICKS: Kristaps Porzingis won’t play this season while continuing his recovery from a knee injury.